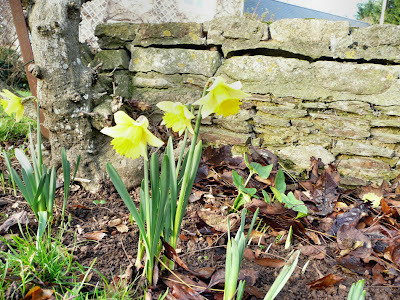 Last Friday I posted about the first daffodils that were coming up in our garden and I've tried to post a daffodil shot every day of this first week of 2012.There were 3 when I wrote that first post and today I counted 11, not bad for one week. Yesterday the weather was so bad I couldn't get a shot but the sun has been out for a short while this afternoon and so out I went, too. After moving some of the dead leaves that are mulching the ground beneath (alright I've been too lazy to clear them away) I found plenty more shoots and also a few daffodil bulbs that some creature has dug up (possibly a field mouse) and started nibbling on. I quickly dug a large hole and popped those back in, they'll possibly survive and bloom later in the Spring. Hopefully my Normandy daffs have cheered up the first few days of January for you, I know that they bring a smile to my face each time I see them, even on the gloomiest day. 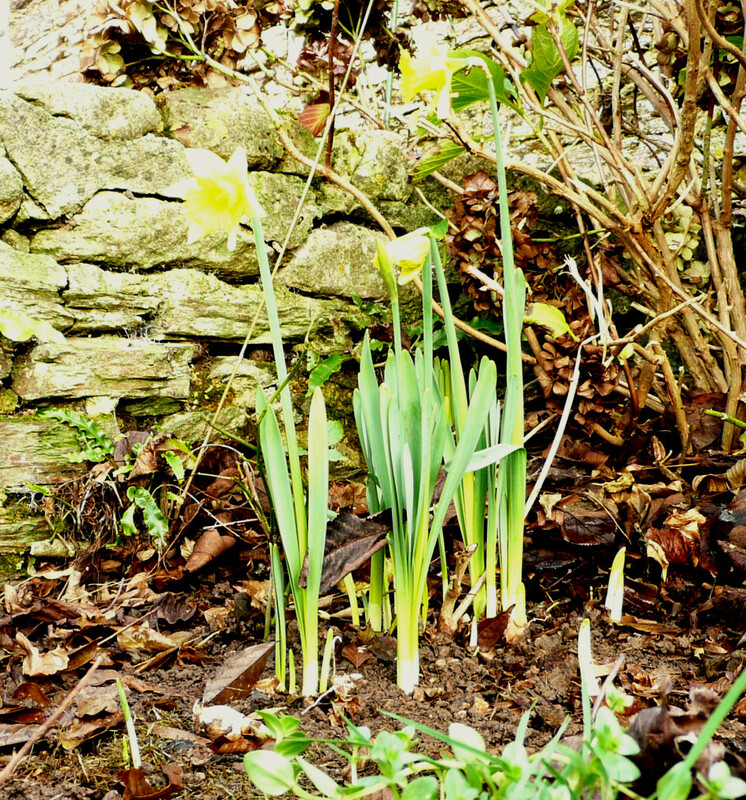 They are lovely daffodils Maggie and very early. I haven't been out much this week to see if there are any around yet. We might go to RHS Wisley over the weekend, so I will look out and photograph them. Hopefully there will be some snowdrops out soon. I have some polyanthus in flower in the front garden and one tiny Forsythia flower on what looks like a dead bush. Have a great weekend, Jackie in Surrey. Hi Maggie, Love the daffodil header. Perfect for the beginning of the new year. I am keeping my own daff watch. Jim put out about fifty bulbs last fall, hope they like their new home and show me how much with their little yellow heads bobbing in the cold wind. Your blog always cheers me Maggie. How fabulous that you already have daffodils, one of my favorite flowers! I'm delighted that you have linked to Potpourri Friday and hope you will make it a weekly party stop! P.S. You should share these today for Fresh-Cut Friday! They do bring a smile to my face! They were one of my grandmother's favorites. And my daughter loves them too! How lucky you are to have the daffodils already!! How can this be? Mine will bloom in April, no sooner. They are so pretty, Maggie, enjoy them! Still haven't tried the chutney yet...this weekend for sure. My nose and head are congested still and I want to be able to taste it!! I'll keep you posted! I can't wait to see daffs here, Maggie. The last such a long time compared to daffs in Ontario - so sunny against the black-green of the forest. Oh the daffodils are so gorgeous and so early. Ours will not pop through the soil until May. I planted 50 more and am counting the days before they bloom. Your daffodil header is just is beautiful. I am envious of your daffodils. It will be late April till we see ours! Enjoy them, they are lovely!